Longtime NBA Coach Flip Saunders Dies At Age 60 : The Two-Way Saunders, who over his nearly two decades as a head coach hauled in more than 650 career victories, is best known as the head coach of the Minnesota Timberwolves NBA franchise. 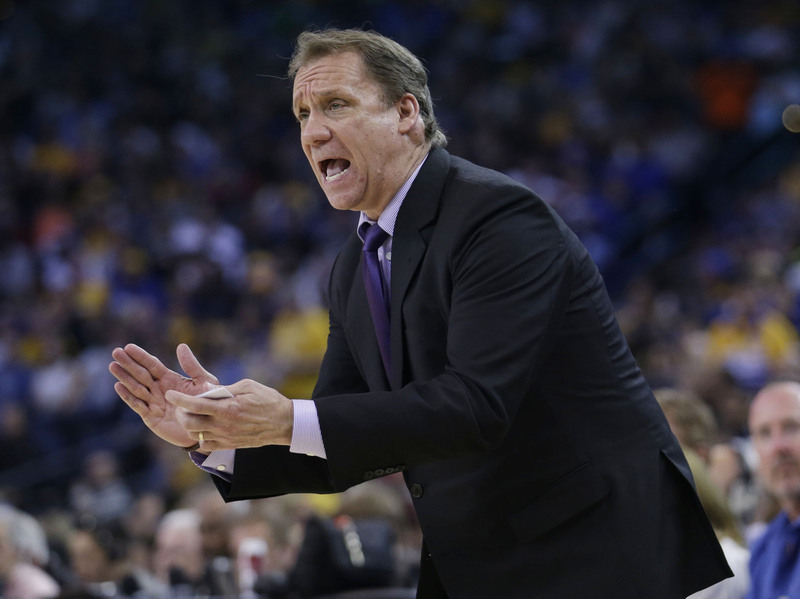 Minnesota Timberwolves announced Sunday its two-time coach Flip Saunders died. Shown here during the second half of a game against the Golden State Warriors in April. Longtime NBA coach and Minnesota Timberwolves president of basketball operations Flip Saunders has died. He was 60 years old, and had been undergoing treatment for Hodgkin's lymphoma over the past few months. We are extremely saddened to learn today Phil “Flip” Saunders has passed away at age 60. The Timberwolves organization announced Saunders' passing via Twitter Sunday afternoon. In a statement, the team's owner Glen Taylor said the organization was "devastated" by Saunders' passing. "Flip was a symbol of strength, compassion, and dignity for our organization. He was a shining example of what a true leader should be, defined by his integrity and kindness to all he encountered. "Today is not a day to reflect on Flip's accomplishments in basketball or what he brought to us as an organization on the court, but rather to indicate what he meant to us as a co-worker, friend, member of the community and the basketball world at large." Saunders, who over his nearly two decades as a head coach hauled in more than 650 career victories, is best known as the head coach of the Timberwolves, but also had a successful run with the Detroit Pistons from 2005-2008, where he took that team to three straight appearances in the Eastern Conference Finals. He also coached the Washington Wizards and worked as an ESPN analyst in between coaching gigs. As ESPN reports, Saunders "was in the process of a major rebuilding effort" with the Timberwolves that also included the building of a new practice facility and renovations at the team's arena, the Target Center. "Saunders first became an NBA coach in 1996 with the Timberwolves and eventually led the team to eight straight playoff appearances. A standout offensive coach, Saunders specialized in coaching point guards. "But perhaps the player he had the greatest impact on was a big man, a wiry kid who came straight from high school in 1995 named Kevin Garnett. Under Saunders' tutelage, Garnett developed into one of the best players in the NBA and eventually an MVP." Born Philip Daniel Saunders, the Minneapolis Star Tribune reports, Saunders received the nickname "Flip" from his mother — a former beautician who heard a customer in the salon refer to her older son Greg by the moniker. But it stuck to her younger son more or less his entire life. "Long after he was deemed too small to make it big in the sport he so loved, Flip Saunders rose from collegiate-playing and professional-coaching careers to become one of the most powerful team executives in the entire National Basketball Association during his second time around with the Timberwolves. "He returned to Minnesota full-time to run the Wolves basketball operations in May 2013, more than eight years after friend and former college coach Kevin McHale fired him as coach the first time around. "Saunders is by a lopsided margin the winningest coach in franchise history — with a 654-592 record in nearly 11 full seasons — and is the only man to coach the team into the playoffs ..."
Below is a sampling of condolences from current and former NBA players on Twitter. You have done so much for so many people, including myself. Thank you coach! You will be truly missed.